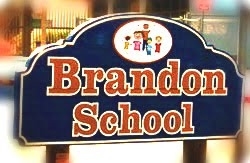 Brandon School opened as the thirteenth school in the Goleta Union School District (GUSD) in 1969. In 1982 Brandon was closed due to a decrease in student enrollment. It was reopened as a full school in 1996 and in 2003 Brandon became the neighborhood school for many students from Glen Annie Road to Winchester Canyon. The school is located at 195 Brandon Drive, south of Cathedral Oaks Road and west of Glen Annie Road in Goleta on California’s central coast near Santa Barbara. Brandon’s school colors are blue and sand. The Brandon Tree was planted in 1969 when Brandon first opened. Since then, this spectacular Fire Coral tree has greeted Brandon students with a message of growth, shelter, and optimism. As our generations of students have grown, the Brandon Tree has grown with them. Sixth grade classes at Brandon have a tradition of creating murals to beautify our school grounds. Mural themes have ranged from a tribute to our location next to the Pacific Ocean, Fruits of California, a tribute to the late artist Keith Harring, Butterflies and the Brandon Community Mural which hangs by the front office and greets visitors to the school.